Beck provides a complementary service called Link-Assist to support the setup and installation of our linkage connected actuator products. Link-Assist is an exclusive linkage program that provides Beck Engineers the ability to design an optimal linkage configuration based on your application specific constraints. 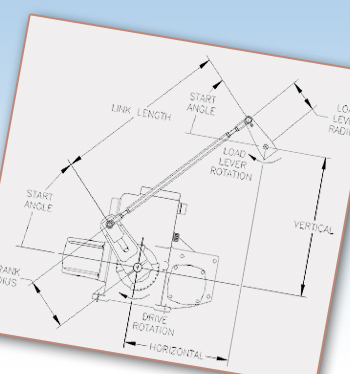 Beck can supply you with the recommended linkage length, crank/lever arm start angles, and crank/lever arm radii. This information is available in a date-stamped comprehensive report that also provides the delivered torque and force profiles throughout travel. Link-Assist reports can be generated for new installations or to ensure optimal setup of existing installations. Download a sample of a completed Link-Assist Report by clicking the to the right. What information is required to obtain a Link-Assist Report? Watch the following video for instructions on how to obtain the necessary information for Beck to provide you with a Link-Assist report. Linkage setup worksheets are available for download to make it easier for recording the data shown in the video to the left. Several worksheet orientations are provided, so that you may select the most appropriate for your application. Once completed, the worksheets may be faxed to Beck at 215-860-6383 or emailed to sales@haroldbeck.com. A Sales or Application Engineer will evaluate and process your Link Assist promptly. Please be sure to include your telephone number, fax number or email address.